Kraków (Pols pronunciation: [ˈkrakuf] ( listen)) also Cracow, or Krakow (US Inglis /ˈkrækaʊ/, British Inglis /ˈkrækɒv/), is the seicond lairgest and ane o the auldest ceeties in Poland. Situatit on the Vistula River (Pols: Wisła) in the Lesser Poland region, the ceety dates back tae the 7t century. Kraków haes traditionally been ane o the leadin centres o Pols academic, cultural an airtistic life an is one o Poland's maist important economic centres. It wis the caipital o Poland frae 1038 tae 1596; the caipital o the Grand Duchy o Kraków frae 1846 tae 1918; an the caipital o Kraków Voivodeship frae the 14t century tae 1999. 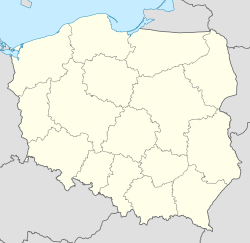 It is nou the caipital o the Lesser Poland Voivodeship. ↑ The Municipality Of Kraków Press Office, 1996–2007, in participation with ACK Cyfronet of the AGH University of Science and Technology, "Our City. History of Krakow, archaeological findings". Retrieved 2007-09-11. ↑ 2.00 2.01 2.02 2.03 2.04 2.05 2.06 2.07 2.08 2.09 2.10 2.11 2.12 2.13 2.14 2.15 2.16 2.17 2.18 2.19 2.20 2.21 2.22 2.23 2.24 2.25 2.26 2.27 2.28 2.29 "Kraków otwarty na świat". www.krakow.pl. Retrieved 2009-07-19. ↑ "A Message from the Peace Commission: Information on Cambridge's Sister Cities," February 15, 2008. Retrieved 2008-10-12. Also in: Richard Thompson, "Looking to strengthen family ties with 'sister cities'," Boston Globe, October 12, 2008. Retrieved 2008-10-12. ↑ "Edinburgh - Twin and Partner Cities". © 2008 The City of Edinburgh Council, City Chambers, High Street, Edinburgh, EH1 1YJ Scotland. Archived frae the oreeginal on March 28, 2008. Retrieved 2008-12-21. ↑ "Intercity and International Cooperation of the City of Zagreb". © 2006-2009 City of Zagreb. Retrieved 2009-06-23. Wikimedia Commons haes media relatit tae Kraków. This page wis last eeditit on 10 Mairch 2018, at 19:45.